If you are looking for a last-minute addition to your holiday table, or a small dish to wow your friends and family, seriously, look no further. This holiday season, I cannot urge you enough to make some (vegan!) 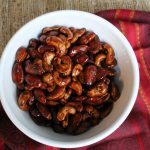 candied nuts to share with the ones you love! Okay, okay, “candied” is not a word I’ve been bandying about lately, since converting to a refined-sugar-free lifestyle. But don’t you worry: these nuts use coconut sugar, which is low-glycemic and unrefined (you can totally sub white sugar if you aren’t on the bandwagon with me), and not even very much of it! For me, the fats and protein in the nuts are worth a few calories from coconut sugar, and the surprising spice blends perfectly with a small hit of sweetness. This recipe is super simple. The only drawback is that the nuts tend to be a bit sticky in the end, but I’m not going to lie…I have no problems with accidentally grabbing a large chunk instead of a single nut when I’m staving off the hunger pangs before a fancy meal! Start by roasting the nuts. This is as easy as dumping them onto a rimmed baking sheet and sticking them in the oven. Please do start with raw nuts! I recommend shaking the pan every 5 minutes to turn the nuts and encourage even roasting, but honestly…you could probably get away without doing that! You can use any nuts you like. I typically make this with raw almonds and raw cashews, but if there were no allergy issues in my family, I would also add pecans and hazelnuts! Yum. While the nuts roast, dump all of the sauce ingredients into a large pan: coconut sugar, coconut oil, cinnamon, cumin, black pepper, cayenne, salt, and water. I know that combination sounds a little weird, but just trust me. It’s divine. 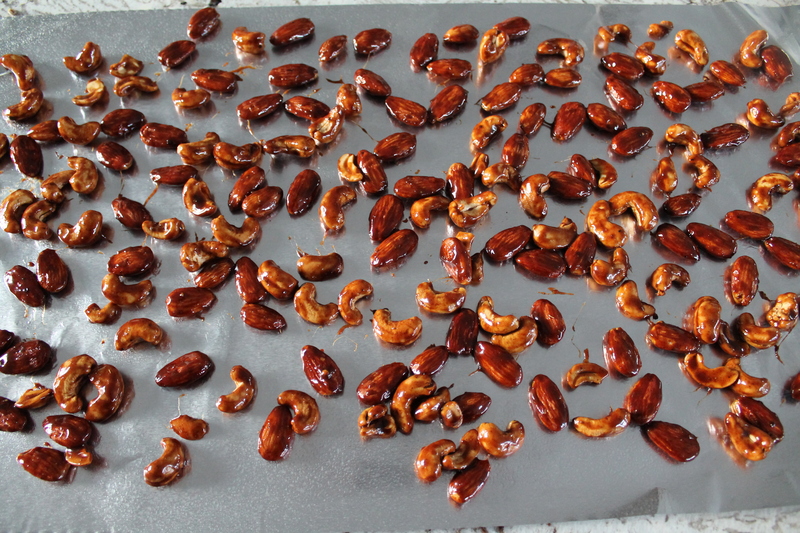 When the nuts come out of the oven, they will be fragrant and toasty brown. Now it’s time to make the sauce! 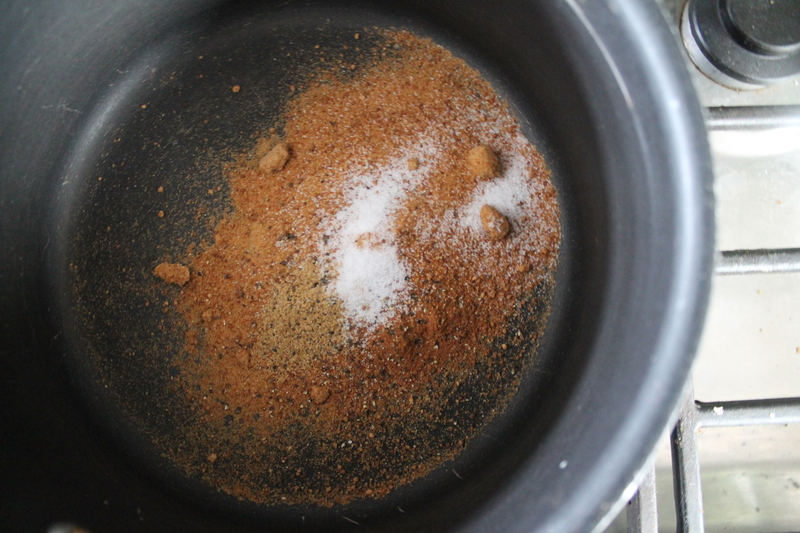 Heat up the pan with all the spices and sugar over a medium-hot fire, stirring the pan constantly. When the sugar and oil have melted and all the ingredients are combined, cook for just 1 minute more, still stirring. Add all of the roasted nuts. 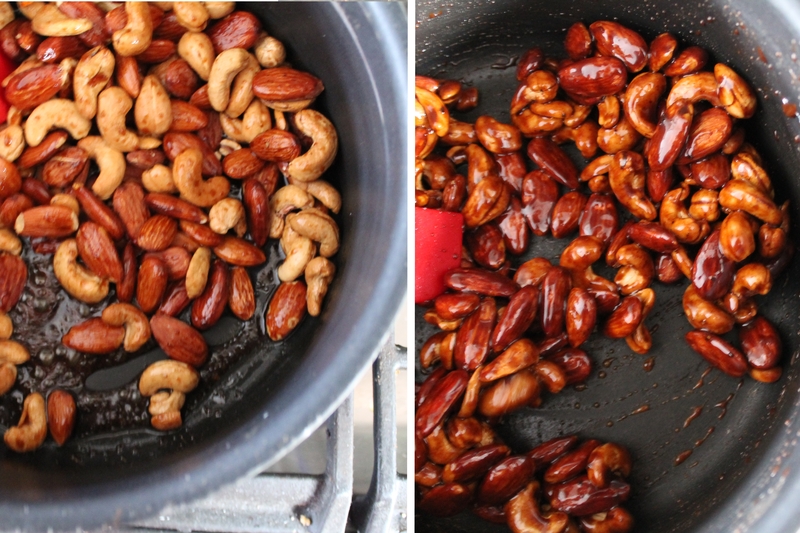 Stir and fold the nuts over each other until the sauce in the pan thickens and completely coats the nuts. This takes less than 5 minutes! 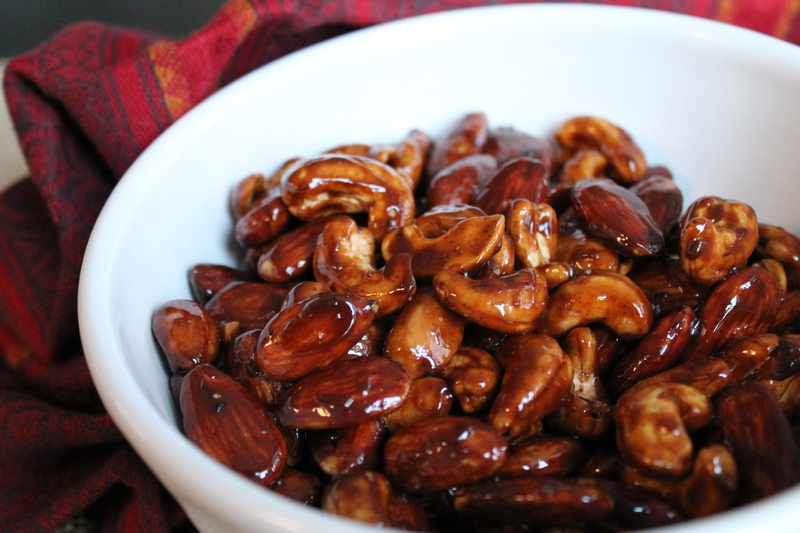 The key to candied nuts is definitely stirring: without stirring, the sugar will burn and the nuts will become a horrible mess. Keep stirring until the nuts are covered evenly in sauce and very little syrup remains at the bottom of the pan. Dump the nuts out on a large, lightly oiled piece of foil. 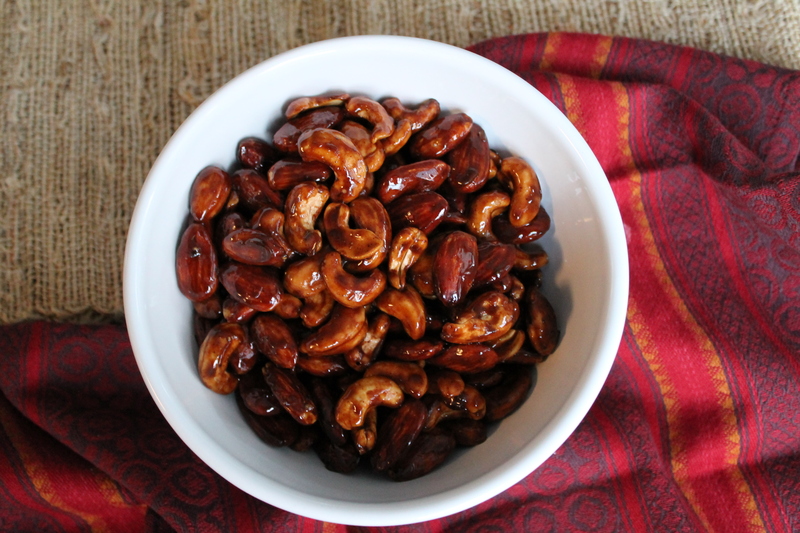 (You can skip the oil if you want, but the nuts will be much stickier if you do.) Using a spatula (because hot! 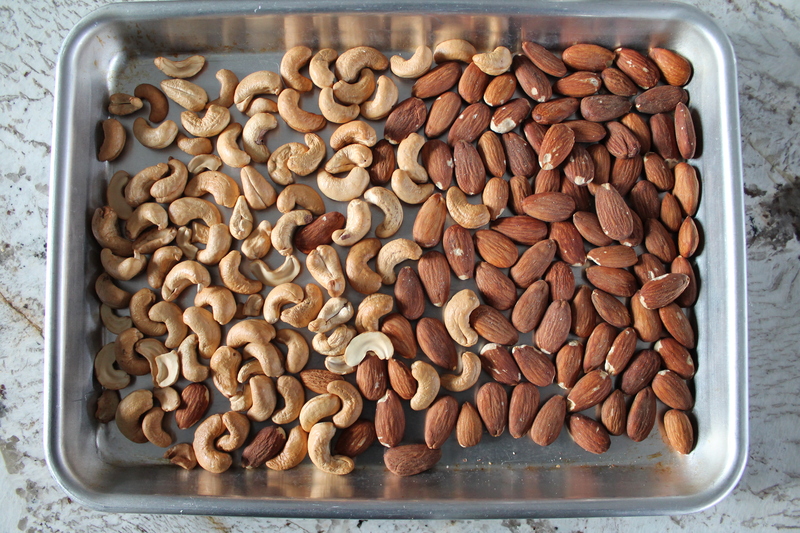 ), separate the nuts so that they are not touching each other. This will help them cool faster and also will help them be less glued together! When they are completely cool, scoop them into a serving bowl. I actually recommend leaving them on the foil until just before you’d like to serve them, if you can, because even when cool they are sticky. I’m not going to lie…the first time I made these, they did not stick together and I thought I was a genius, but literally every other time (many, many times), they have clung to each other as soon as I scooped them off the foil into a serving bowl. That’s just life. These are still worth it! I mitigate this by keeping them on the foil as long as possible, and periodically stirring them in the serving bowl after I transfer them. 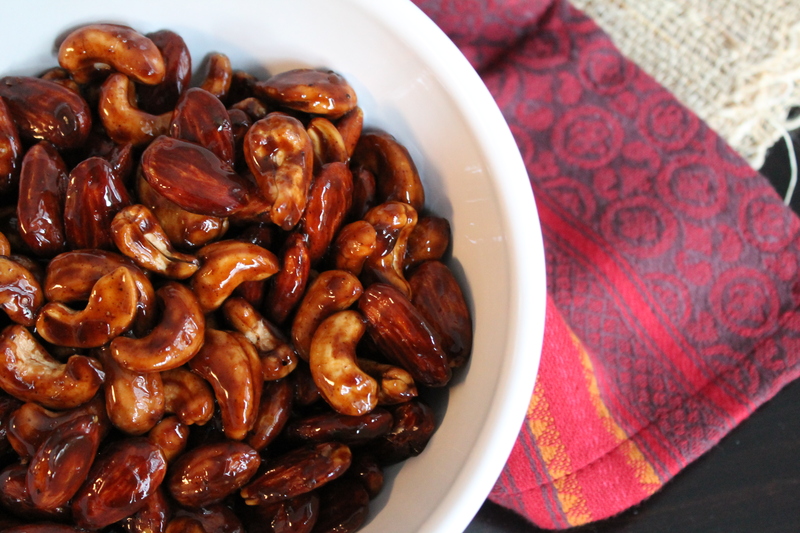 You can enjoy these nuts as soon as they are cool enough to handle! They are soft and crunchy at the same time, sweet and spiced. They are lovely and I hope you enjoy them! Heat the oven to 350°. 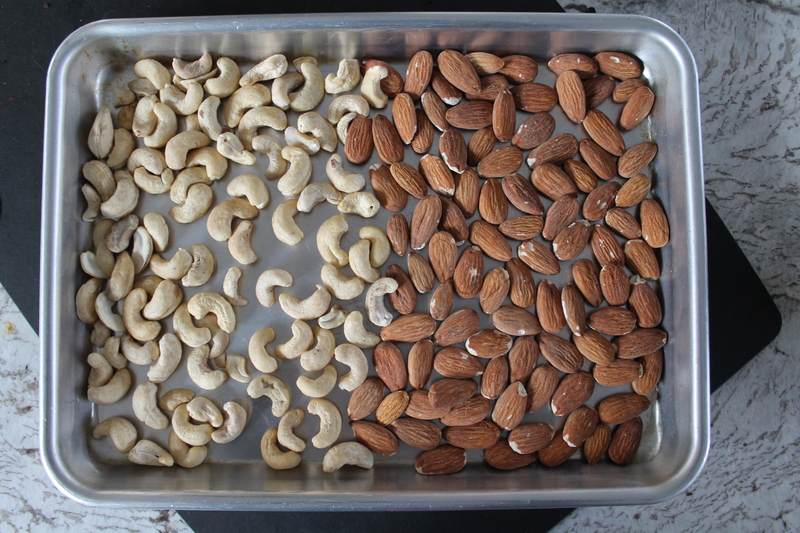 Lay the nuts in a single layer on a cookie sheet. Toast the nuts in the oven until golden and fragrant, about 20 minutes, shaking the pan to turn the nuts every 5 minutes. Remove from the oven to cool slightly. Mix together the remaining ingredients in a large saucepan. 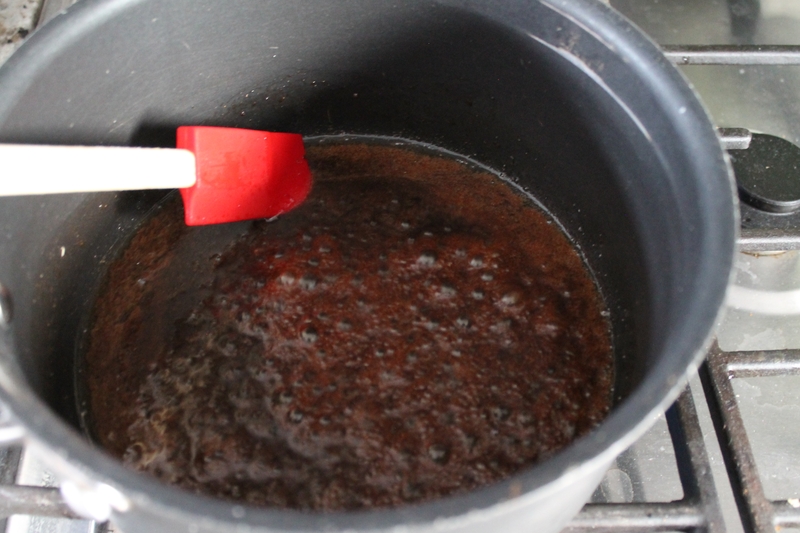 Once the sugar and oil melt, cook, stirring constantly, for 1 minute more. Stir in the nuts and cook, stirring constantly, about 5 minutes, or until the sauce completely coats the nuts. Transfer to a lightly oiled sheet of foil. While still warm, separate all of the nuts completely so they do not get stuck together. Allow to cool before eating. The nuts may still be sticky, even after cooling. *This recipe also works well with other nuts, such as pecans and hazelnuts.